Steel Cut Oats and Fruit Compote from The Veggie Queen. We tried this over the weekend and it’s going to be a regular now. Rosemary Roasted Potatoes, from my friend Janet who showed me how to make these in Vermont. Costa Rican Potatoes and Beans from Dr. McDougall’s New IPhone App. Have you checked this out yet? It’s amazing! All you need to do is enter the ingredients you have, and a lot of different recipes pop up. 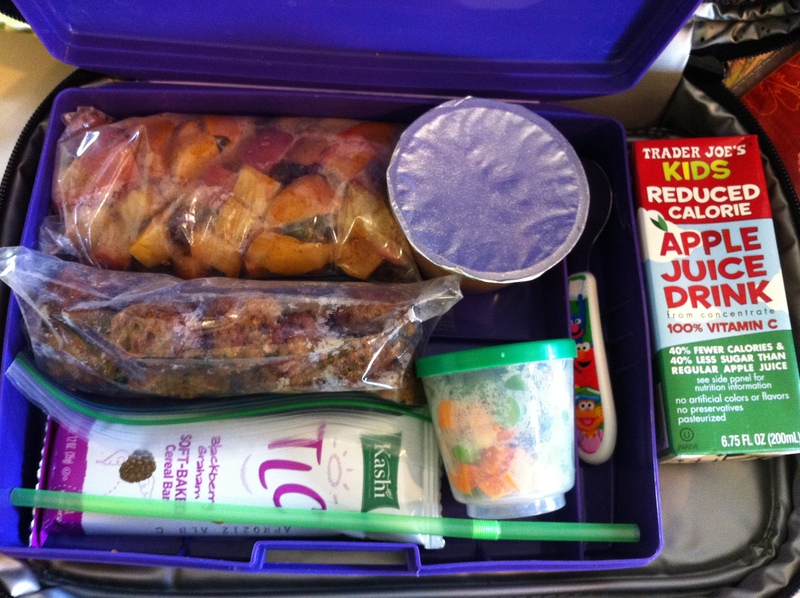 I had fun packing Little T’s food for Disneyland. I made him baked apples with cinnamon and cranberries and meatless meatballs. I also threw in some vegetables with lemon juice, a couple of vegan breakfast bars in case he was still hungry, pear sauce, and an apple juice from Trader Joe’s. He wound up eating all of the apples and veggies, and then shared my dinner with me. I need to find some reusable sandwich bags. because they taste good, are easy, and compliment other food, and if you are a kid, you can put ketchup on ’em. Re: Reusable snack bags – You could try the Planet Wise snack bags on Amazon. They look super cute! I’ve used Planet Wise wet bags for cloth diapers, and I’m happy with how the bags are holding up after repeat washings. That sounds perfect! Thanks Cathy!